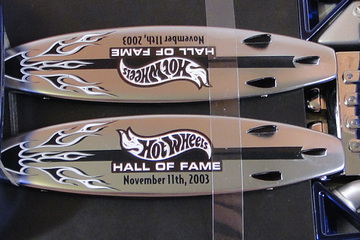 The event was held on November 11, 2003, at the first-permanent Hot Wheels exhibit (originally opened on April 24, 2003) within the Petersen Automotive Museum. Part of Wilshire Blvd. was closed to allow participants to exit their rides in red carpet style. Some of the guests in attendance were Richard Petty, George Barris, Wally Parks, Elliot Handler, Parnelli Jones, Amy Boylan, Carson Lev and Jay Leno. Carson and Leno officially debuted the life-sized Hot Wheels Deora II (built by Chip Foose and 5-Axis). Before its removal in 2015 (when the Petersen Automotive Museum was remodeled, Disney Cars replaced Hot Wheels's position), the exhibit was maintained by Bryan Hiladek, a writer for the Hot Wheels Newsletter. He collected since 1996, and many of his collecting interests were reflected in the exhibit , including models from the following sublines: HW Basics, HW Classics, 100% Hot Wheels, Premiums, RLC exclusives, Convention cars, Disney Cars, Highway 35 World Race, and AcceleRacers. Below is a growing list of all of the cars/specific model variants that were on display at the museum.